When Valerie Sabatino arrives at his home on Oahu, the last thing Harry Pines wants is missing-persons action. There are two reasons why Harry’s not the kind of guy who knocks on doors looking for business with his hat in his hand, and the other one is he doesn’t wear a hat. 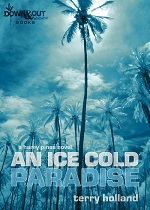 In AN ICE COLD PARADISE Harry and his handy band of friends in Chicago and Hawaii peel back the curtain on a world of runaway girls turned into hookers and of soldiers paying off their gambling debts by stealing firearms. The stolen goods are used to fuel the mean little army of a loony Mormon Fundamentalist named Orrin Massey, who thinks he’s the “One Mighty and Strong” right out of the original Mormon playbook. Harry Pines is the enormously entertaining creation of Terry Holland, who arrives here walking in the footsteps of Hammett, Chandler, Spillane, MacDonald, and Parker.